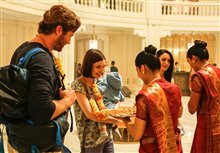 On November 26, 2008, Arjun (Dev Patel) leaves his wife and child as he makes his way to Mumbai, where he works at the majestic Taj Mahal Palace Hotel. Soon after, the Indian city is rocked by a wave of devastating terror attacks, throwing the bustling metropolis into chaos. In the heart of the city’s tourist district, Jihadist terrorists are responsible for multiple bombings as armed gunmen make their way through the city, destroying everything in sight and shooting down innocent people. 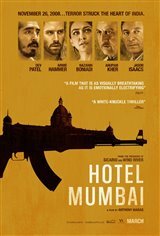 They force their way into the prestigious Mumbai hotel, where up to 1,000 guests and 500 staff members are taken hostage. With local police unprepared for such a threat, the only hope the hostages have is in themselves. They must work together to escape the terrorists, and survive a desperate struggle for their lives.